Ahhh creamy carbonara. It’s the original poor-man’s pasta with its bare bones ingredient list and rich, belly satisfying flavor. But, as times change so do the availability and prices of ingredients. 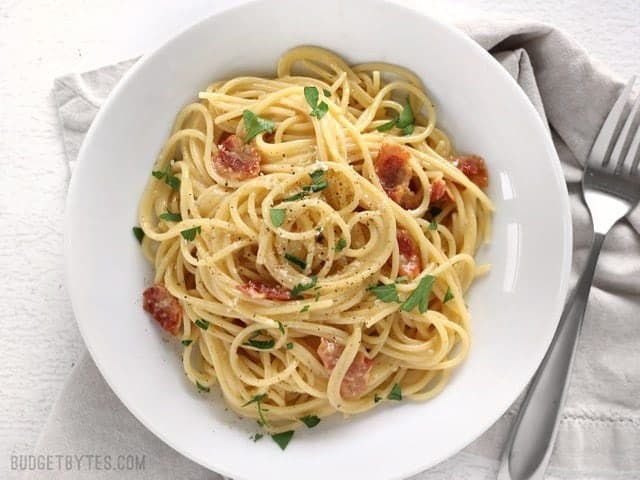 The once inexpensive guanciale (pork) and Pecorino Romano cheeses that made this pasta so scrumptious are not as readily available or affordable in modern day America as they may have been when and where this dish originated. 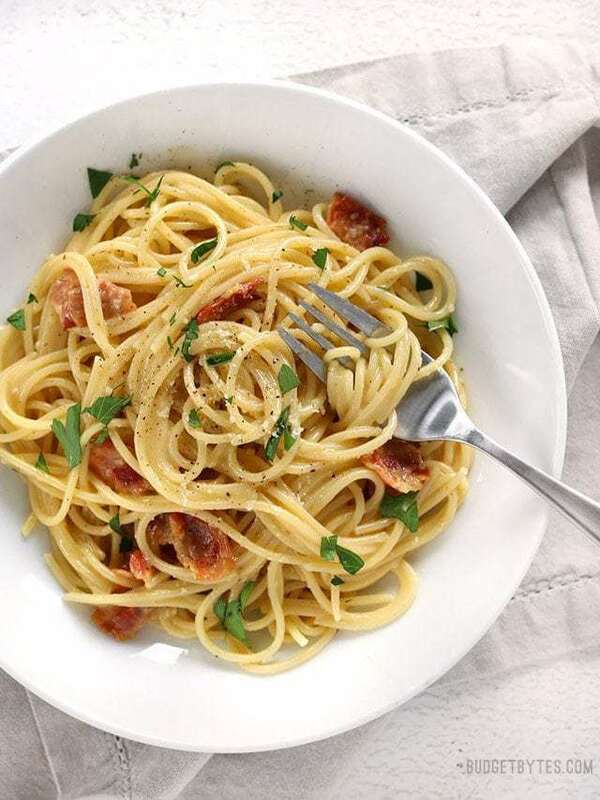 So, today, we’re making a modern day budget-friendly version of Spaghetti Carbonara that is every bit as creamy, delicious, and weeknight friendly as the original, but a little less heavy and a lot more accessible for American cooks. I used only a small amount of bacon in my carbonara to keep prices low and make the dish a little lighter (because honestly, I sit at a desk all day). Luckily, bacon has such a strong flavor that it still permeates throughout the dish. Good Pecorino Romano can be pretty expensive, so I used the grated Parmesan that I have on hand. But it’s true, the better the cheese you use for this dish the better the end product will be, so if you can spring for a wedge of Parmesan, go for it! But by all means, don’t use a “Parmesan topping” or something that is blended with fillers. No ma’am. 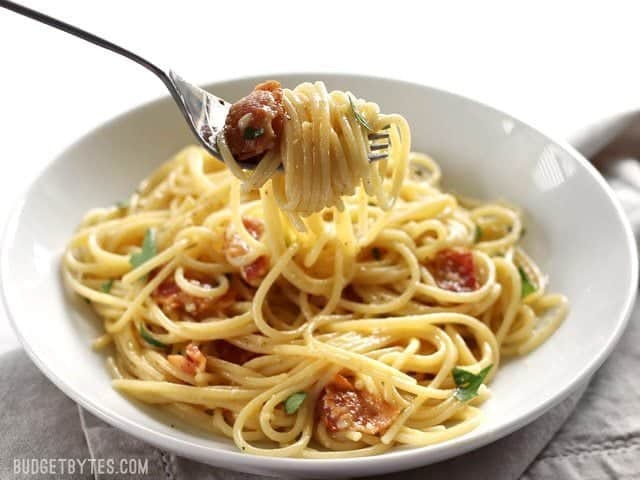 Spaghetti Carbonara is fast and easy dinner with just a few ingredients and a luxuriously creamy sauce. Fill a large pot with water for the pasta and season with salt. Place a lid on the pot and bring it up to a boil over high heat. While waiting for the water to boil, cut the bacon into small pieces. 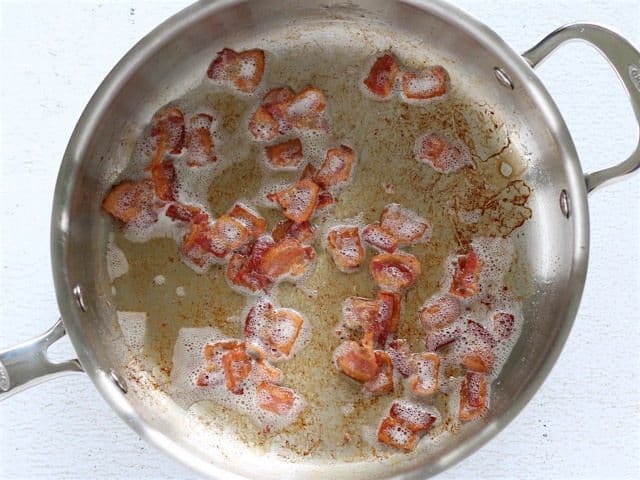 Cook the bacon in a large skillet over medium-low heat until brown and crispy. Remove the cooked bacon from the skillet, then turn the heat down to low. Mince two cloves of garlic, add them to the warm skillet, and sauté for about one minute or until fragrant and softened, then turn off the heat. 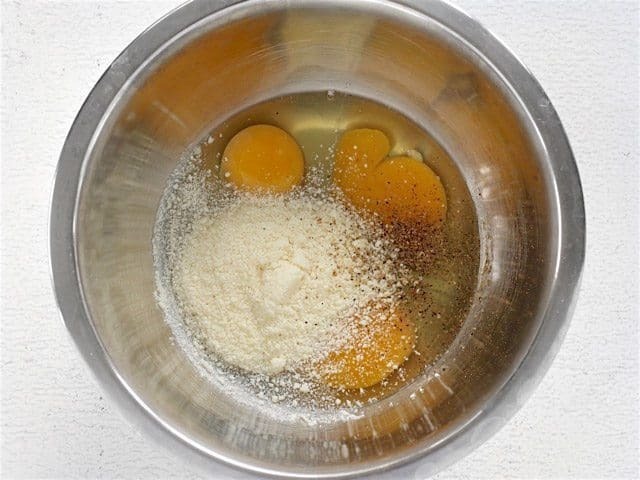 In a medium bowl, whisk together the eggs, 1/2 cup of the Parmesan, and a generous dose of freshly cracked pepper. 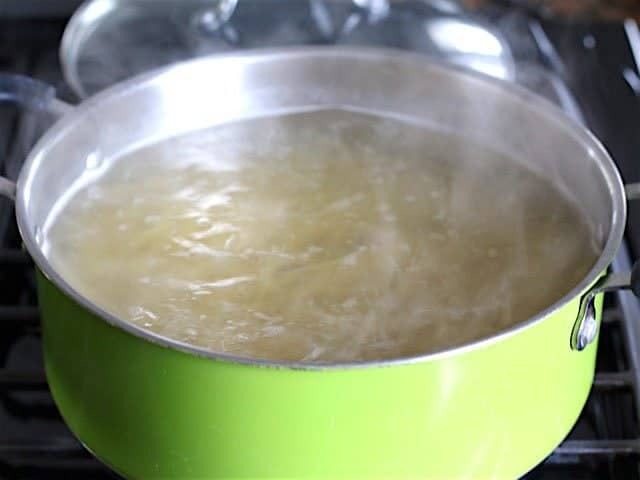 The water should be boiling at this point, so add the pasta, stir well, and continue to boil the pasta until al dente. 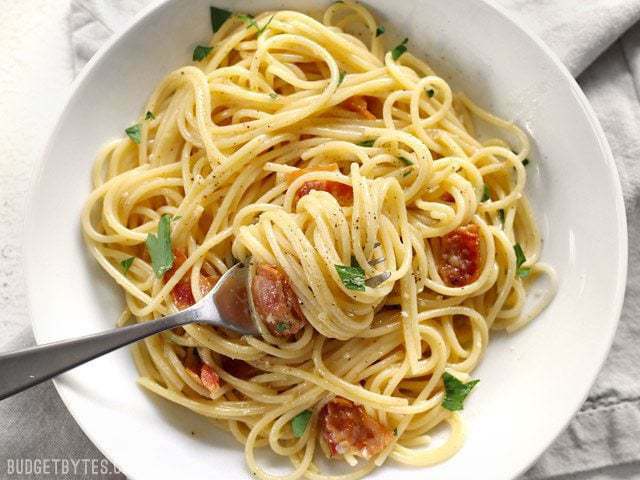 Reserve one cup of the starchy pasta cooking water, then drain the pasta in a colander. Add 1/4 cup of the reserved pasta water to the skillet that was used to cook the bacon. Stir the warm water in the skillet and dissolve the browned bits from the surface of the skillet. Add the steaming hot drained pasta to the skillet and toss in the bacon liquid in the skillet. Pour the egg and Parmesan mixture over the hot pasta and immediately begin to stir or toss the pasta. 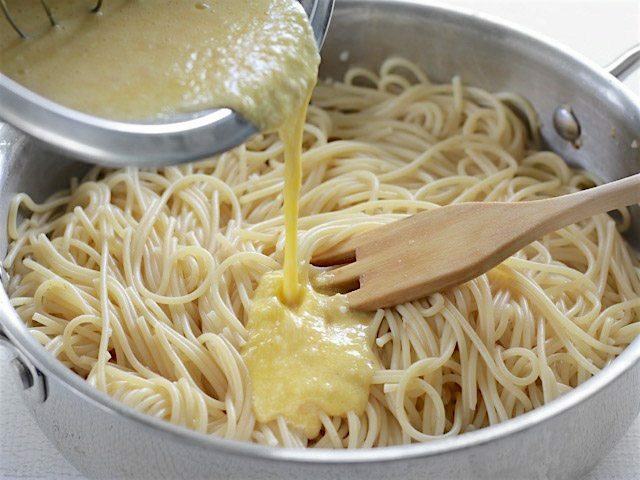 Continue to stir the hot pasta in the egg mixture until a creamy sauce forms. Add the remaining Parmesan, a little more freshly cracked pepper, and the reserved bacon bits, and toss again. 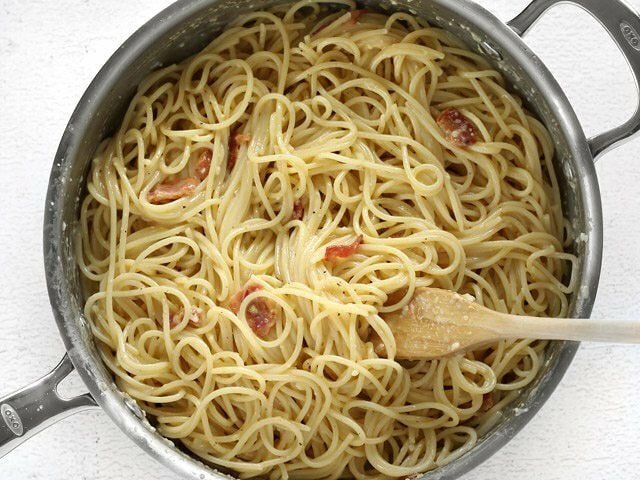 If the pasta becomes too thick or dry, add a splash more of the reserved pasta water. Finally, taste the pasta and adjust the salt, Parmesan, or pepper if needed. Top with a pinch or two of roughly chopped parsley leaves. To make this recipe a little more affordable, I’m using bacon (a small amount) instead of guanciale or pancetta. I only used 3oz., or 1/4 of this 12oz. package. I like to cut my bacon packages into quarters and then freeze the rest. That way I can grab out 1/4 at a time to use as needed. Cut the bacon into smaller pieces, then brown the bacon in a large skillet over medium-low heat. Remove the bacon from the skillet, then turn the heat down to low and add two cloves of minced garlic. Sauté the garlic for about one minute, or just until it loses its raw edge. Then turn the heat off. Bring a large pot of salted water to a boil, then add the pasta. Stir the pasta, then continue to boil until tender. 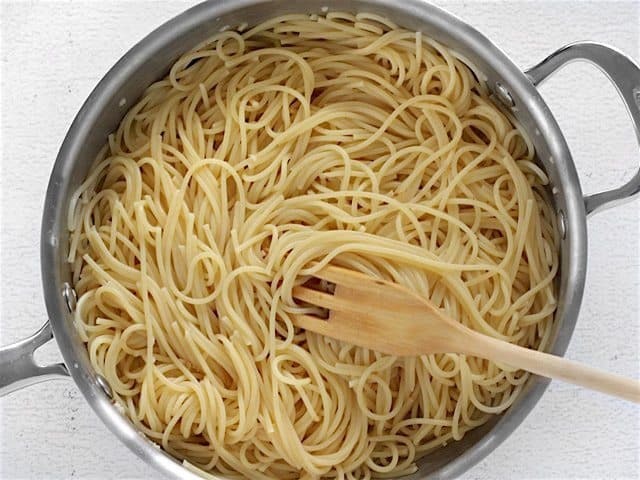 Reserve 1 cup of the starchy pasta cooking water, then drain the pasta in a colander. While you’re waiting for the pasta to cook, whisk together 3 large eggs, about 1/2 cup grated Parmesan, and a hefty dose of freshly cracked pepper. Add about 1/4 cup of the reserved pasta water to the skillet that was used to cook the bacon. 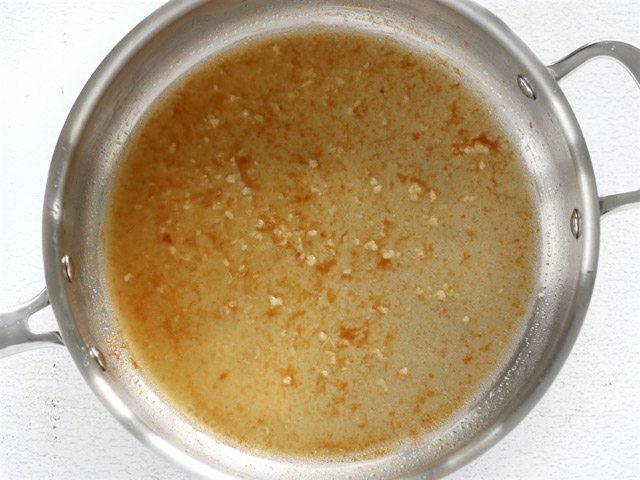 Stir the hot cooking water to dissolve the browned bits from the bottom of the skillet. 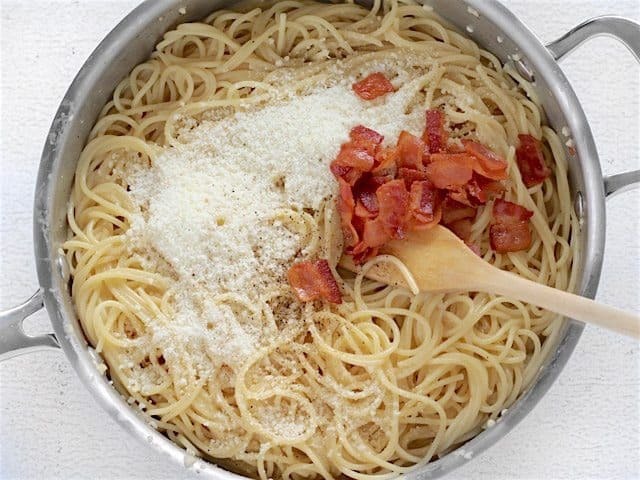 Toss the drained (but still steaming hot) pasta in the skillet with the bacon water. Pour the egg and Parmesan mixture over the hot pasta. Immediately begin stirring or tossing the hot pasta to distribute the egg mixture and prevent it from curdling. Stir until a creamy sauce forms (this happens quickly). Finally, add the remaining 1/4 cup Parmesan, the reserved bacon, and more pepper. Toss the pasta until the Parmesan melts into the sauce. 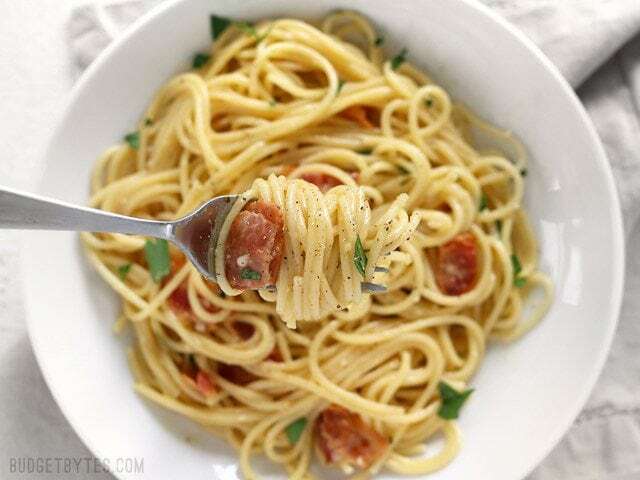 To finish the pasta, just give it a taste and add salt, pepper, or Parmesan if needed. Top with a little fresh parsley, if you like a lil’ green with your creamy dreamy pasta. What veggies would you add to this to add more volume with less calories? Like i was thinking spinach and onions but I don’t really know. Any thoughts? So good and so easy! My two kids (11 and 8) cleaned their plates, which is rare in this house. I accidentally added 3/4 cup of pasta water instead of 1/4 cup, but it still turned out great. I’ll definitely make this again. First time making it, and it was a hit! It was an amazing dish I would gladly make over and over again!! Omg! SO delicious! Possible the best pasta I’ve ever made! Love love love. 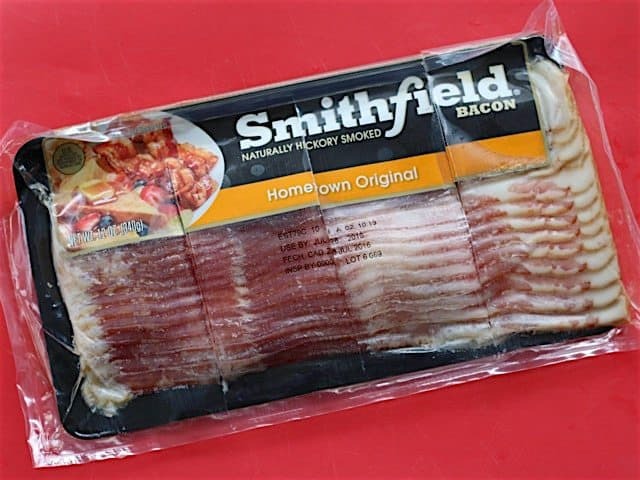 Silly question but how do you cut your bacon? Do you use kitchen scissors or do you cut it with a knife? I’ve made this recipe before and loved it but had a lot of trouble cutting up the bacon. Yep, I just use a knife. :) I don’t separate the pieces before I cut them, I just cut across the slab. Sometimes I even do it right through the plastic package. Just made this with some Smoked Sausage instead of bacon. Turned out great! Just made this for myself and my fiance. I expected that I’d mess up the sauce somehow, but the end result was the best non-tomato sauce slathered thing I’ve had in my entire life! I finally tried this recipe and it turned out great. My husband and daughter described it as restaurant quality. I wasn’t sure about using the beaten eggs and Parmesan as a sauce but it turned out great. My big concern was it would turn out “eggy” in texture but it turns into a yummy sauce instead. Simple ingredients make a rich tasting dish. 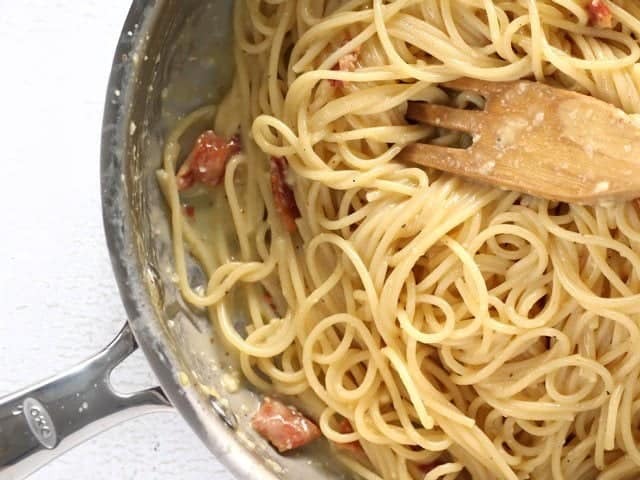 Pasta carbonara always has been one of our go-to recipes, but I would always forget which website I used last. Then I thought to search your site and haven’t used another since! You always manage to get so much flavor out of a deceptively simple recipe. Thank you, as always! !